Women in company towns had few employment opportunities, but they were also spared the isolation that afflicted many farm women. Men and children benefited from enhanced recreational facilities, such as the baseball fields found in most towns. While native white, African American and immigrant ethnic groups were generally housed separately in distinct clusters, the opportunities for interaction in town life and the un-segregated character of underground working conditions contributed to a richer cultural diversity than any of the three groups had encountered elsewhere. Even shared conditions of hardship and danger in the mines contributed to a sense of community solidarity that residents often later recalled fondly. Wyoming County was created by the Virginia General Assembly on January 26, 1850 from the upper portion of Logan County. There are conflicting reports concerning the county name's origin. Most historians believe that it came from a loose translation of the Delaware Indian word Maughwauwama, meaning "large or extensive plains." Others believe that it originated from a poem written by Thomas Campbell entitled "Gertrude of Wyoming." Since its formation, parts of Wyoming County have been used to form Raleigh County and McDowell County. Located in southeastern West Virginia in the Kanawha Valley, Fayette County was created by an act of the Virginia General Assembly in 1831 from parts of Greenbrier, Kanawha, Logan and Nicholas counties. At the time of its formation, Fayette County contained the area from which Raleigh County would later be formed. Fayette was named in honor of the Marquis (Gilbert Motier) de LaFayette (1757-1834), French military hero and American ally during the American Revolutionary War. Mercer County was created by an act of the Virginia General Assembly on March 17, 1837, from parts of Giles and Tazewell counties (Virginia). The county was named in honor of Brigadier General Hugh Mercer (1725-1777). He was born in Scotland and educated in medicine at Marischal College in Scotland. He immigrated to Philadelphia in 1746 and later moved to Fredericksburg, Virginia. He served as a surgeon in the French and Indian War of 1755 and in the American Revolutionary War. He was mortally wounded by bayonet by British soldiers at the Battle of Princeton, New Jersey on January 3, 1777. He died from the wounds on January 12, 1777. Among his descendants was General George S. Patton, one of America's finest military leaders during World War II. McDowell County was created by an act of the Virginia General Assembly on February 28, 1858, from parts of Tazewell County (Virginia). The county was named in honor of James McDowell (1795-1851). The son of Irish immigrants, he served as a member of the Virginia Assembly (1831-1843), was the 25th Governor of Virginia (1843-1846), and represented Virginia in U.S. House of Representatives from 1846 until his death in 1851. Mingo County is the youngest county in the state, formed by an act of the state legislature in 1895 from parts of Logan County. Its founding was related to a legal protest by a moonshiner who claimed that the Logan County Court that had found him guilty did not have jurisdiction over his case because his still was actually located in Lincoln County. A land survey was taken and discovered that the defendant was correct. The charges were then refilled in Lincoln County court. Although the moonshiner was ultimately found guilty of his crime, the state legislature was made aware of the situation and determined that Logan County was too large for the expeditious administration of justice and decided to create a new county, called Mingo. The county was named in honor of the Mingo Indian tribe that had been the earliest known settlers of the region. Located in Southwestern West Virginia along the Ohio River, Cabell County was created by an act of the Virginia General Assembly on January 2, 1809 from part of Kanawha County. It was named in honor of William H. Cabell (1772-1853), who served as Governor of Virginia from 1805 to 1808. He was born on December 16, 1772 in Cumberland County Virginia, graduated from William and Mary College in 1793 and began practicing law in Richmond the following year. He was chosen as a representative to the Virginia General Assembly from Amherst County in 1796 and was re-selected six times until his election as Governor. After serving for three years as Governor, he served as a Judge of the General Court until 1811 and then a Judge of the Virginia Court of Appeals until his retirement in 1841. He served as the President of the Court from 1822 until his retirement in 1841. He died on January 12, 1853 in Richmond. Wayne County was created by an act of the Virginia General Assembly on January 18, 1842 from parts of Cabell County. The county was named in honor of General "Mad" Anthony Wayne (1745-1796). Anthony Wayne was born on January 1, 1745 in Eastown, Chester County, Pennsylvania. He was educated in Philadelphia and operated a surveyor's office in Eastown. He was sent to Nova Scotia in 1765 to locate a grant of land given to a company of Pennsylvanians and was the superintendent of the settlement for two years. He then returned to Eastown and his surveyor's office. He was appointed a representative to the Pennsylvania General Assembly in 1773 and left that position in 1775 when he was commissioned a Colonel in the Continental Army. Following a series of brilliant military maneuvers during the American Revolutionary War at the Battles of Ticonderoga, Morristown and Brandywine, he was promoted to Brigadier General and given the title of "Mad" Anthony Wayne. He later captured an important British garrison at Stony Point on the Hudson River. In 1783, he retired from the military with the rank of brevet major general. He later served in the Pennsylvania convention that ratified the U.S. Constitution. He then relocated to a farm granted to him by the state of Georgia for his service in that state during the war. He was elected to the U.S. House of Representatives from Georgia in 1791. He was called out of military retirement in 1792 by President George Washington to command an American military force that was being organized to put down a major Indian uprising on the western frontier (along the Ohio River). His command of about 3,000 men engaged and defeated a force of about 2,000 Indians at the Battle of Fallen Timbers on August 20, 1794 near the present site of Toledo, Ohio. The decisive battle led to the end of the Indian uprising. On August 3, 1795, twelve Indian chiefs signed articles of agreement "to bury the hatchet forever" and the treaty, known as "Wayne's Treaty," marked the end of major, organized hostilities with the Indians in what is now West Virginia and along the Ohio River on the western frontier. He died on December 15, 1796. Kanawha County's formation was authorized by the Virginia General Assembly on November 14, 1788 from parts of Greenbrier and Montgomery counties. It was actually formed on October 5, 1789. According to the national census of 1800, Kanawha County had 3,239 residents, the 11th largest population of the 13 counties then in existence within the present state of West Virginia. Berkeley County had the largest population then (22,006) and Wood County had the smallest population (1,217). George W. Summers was born on March 4, 1804 in Fayette County, Virginia. He was moved to the Kanawha Valley, near Clarksburg, by his parents when he was an infant. He graduated from Ohio University, studied the law and was admitted to the Virginia bar in 1827. In 1830, he was elected to the Virginia General Assembly and represented Kanawha County in the General Assembly from 1830 to 1840. He was elected as a Whig to the U.S. House of Representatives and served there from 1841 to 1844. He was a member of the Virginia Constitutional Convention of 1850, ran for the Governorship of Virginia in 1850 but lost to Joseph Johnson, and was then elected Judge of the Eighteenth Judicial Circuit of Virginia, serving from 1852 to 1858. In 1861, he represented Kanawha County in the Virginia Convention that passed the Ordinance of Secession, which he opposed. He died in September 1868. Lincoln County was created by an act of the West Virginia state legislature on February 23, 1867, from parts of Boone, Cabell, Kanawha, and Putnam counties. The county was named in honor of President Abraham Lincoln (1809-1865), the 16th President of the United States (1861-1865). Historians regard him as America's greatest President. Abraham Lincoln was born in Hardin County, Kentucky on February 12, 1809. Self-educated, he studied law and became an attorney. He began his political career in 1832 when he lost his first attempt to gain political office, losing a race for the Illinois state legislature. Refusing to give up, he ran again in 1834 and won and served in the state legislature until 1840. He later represented Illinois in the U.S. House of Representatives (1847-1849) and twice ran for the U.S. Senate. He lost both times. However, his seven debates with Stephen A. Douglas in 1858 concerning slavery and other issues of the day made his name a household word. It was during the 1858 campaign that Lincoln gave his famous "House Divided" speech. After his second defeat, he became active in the new political party, the Republicans. He won the presidential election of 1860 as the Republican Party’s nominee, with only 39 percent of the popular vote. The southern states, objecting to his anti-slavery views, seceded from the Union, leading to the outbreak of the Civil War. He issued his famous Emancipation Proclamation on September 22, 1862 and his Gettysburg Address, delivered on November 19, 1863. Boone County was formed from an act of the Virginia General Assembly on March 11, 1847 from Cabell, Kanawha, and Logan counties. The county was named in honor of Daniel Boone (1734-1820), the famous hunter and explorer, founder of Kentucky, Lieutenant Colonel of the Virginia militia, and member of the Virginia General Assembly representing Kanawha County (in 1791). Although Daniel Boone was known as a son of Kentucky, he was born on November 2, 1734 in the Schuylkill Valley in Pennsylvania. He moved with his parents to Yadkin Valley, North Carolina in 1750. He later married and started a family there, and was active as an Indian trader in that area. He visited the present site of West Virginia in 1755 as a member of General Braddock's army that was defeated by the Indians on the Monongahela River. A few years later, he explored the future site of Kentucky and moved his family there. In 1788, he lost his Kentucky property because he failed to properly enter his land grants. Homeless, he moved to Point Pleasant, in West Virginia, for nearly a year, and then moved to present-day Charleston. He lived in Charleston for seven years (1788-1795). In 1789, he was named a Lieutenant Colonel of the state militia, and, in 1790, he was elected to the Virginia General Assembly. He left West Virginia in 1799, moving to Missouri, where he had been granted 1,000 acres of land by the Spanish government and given a government position overseeing the area. He died on September 26, 1820 in Missouri. Raleigh County was created by an act of the Virginia General Assembly on January 23, 1850, from parts of Fayette County. It was named in honor of Sir Walter Raleigh (1552-1618), an English soldier, adventurer, and the favorite of Queen Elizabeth. In 1584, Sir Walter Raleigh convinced the Queen to finance an expedition to the New World. He set sail from London in April 1584 with two ships. He was to explore the New World and find gold or other riches for the Queen. He reached the shore of North Carolina in July and remained there until September before returning to England. Although he did not find gold, he returned with a glowing description of the country. Happy to see his safe return, the Queen knighted Raleigh, named him Captain of the Queen's Guard, and appointed him to Parliament. The land was named Virginia, in the Queen's honor (unmarried, Queen Elizabeth was known as the "Virgin Queen"). Raleigh then convinced the Queen to send another fleet of ships to the continent to found a settlement and, by so doing, secure the lands from the St. Lawrence on the north to Florida on the south from the Spanish and the French. A total of 108 men made the voyage and established themselves on Roanoke Island, now North Carolina. Most of the "settlers" were actually speculators hoping to find gold and other riches and were not used to the hard work necessary to establish a permanent colony. When the supply ships returned later that year, most of the colonists, distressed that they had not found an easy way to get rich, demanded to be returned to England. Only 15 men volunteered to stay. In 1587, another fleet of ships brought more colonists to the Island, but when they arrived there was no trace of the 15 men who had stayed behind. It was assumed that they had been murdered by Indians. The colonists decided to stay and restart the colony only after the commander of the fleet assured them that he would return immediately with reinforcements. However, by the time the ships reached England a war had broken out between Spain and England and the ships were needed to defend the nation. A fleet of ships were finally sent to the colony in 1590, but when they arrived at the island, there was no trace of the colony. Sir Walter Raleigh's dream of an American colony had failed. These easy to download maps are provided by Chris Della Mea. 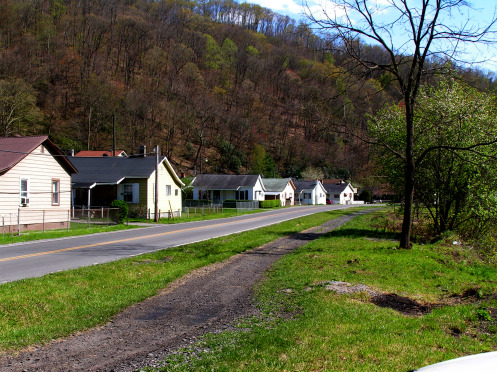 Chris travels throughout the coalfields photographing coal camps that have with stood the many changes that have taken place over the last century. In cases where the town no longer exist Chris searches for remnants and other evidence to document that piece of coalfield history.